This is my 3rd push-pull amplifier, this time using the beefy 6550 power tubes (KT88's). It is switchable between ultralinear mode and triode mode with varying degrees of feedback. I built a 6.3V regulator with the intent of regulating all voltages but it produced a LOT of heat. IN reality, with a push-pull amplifier, it is not really necessary to use regulated DC voltage, so I used the 6.3VAC, and wired it carefully to avoid 60Hz hum. A humbucker was also added to make the amp dead quiet. The bias voltage and the +500V to the anodes of power tubes are not regulated, although using "capacitor multipliers", the ripple is reduced to millivolts. It is known that the 115VAC line voltage varies during the day. For example, if the line voltage goes up 5%, the unregulated filament voltage goes up 5% to 6.6V and the power tube anode voltage goes to 525V, significantly increasing the current through the tubes. At the same time, however, the unregulated bias voltage becomes more negative, biasing the power tubes colder, thus offsetting this effect somewhat. The previous amp had messy logic circuitry for soft-start, clunky controls and more messy logic circuits for bias voltages and cathode currents, with an analog ammeter, and frankly, not very good circuit protection in the event of overcurrents, etc. 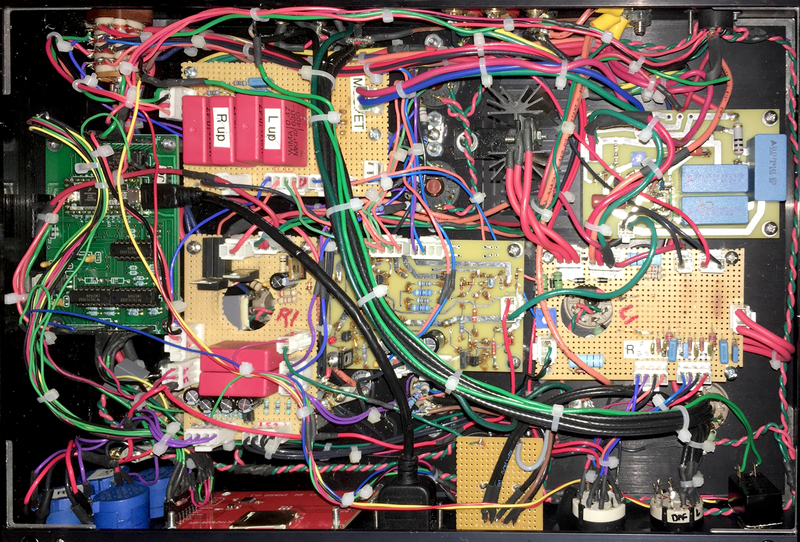 This new amp employs a microcontroller to control every facet of startup, circuit protection, and automatic shutdown by monitoring all voltages, as well as power tube cathode currents, temperature, and, in future projects, input and output from a preamp. More on this later. Below is the amp opened up to show the interior viewed from the bottom. There is a tremendous amount of wiring outside of the printed circuit boards. The wiring for the tubes themselves is underneath all this. Obviously, working on this amp in the event of a malfunction will be a nightmare. Update: as of December 2018, Ben reports that the amp is still working well, including the computer and screen. 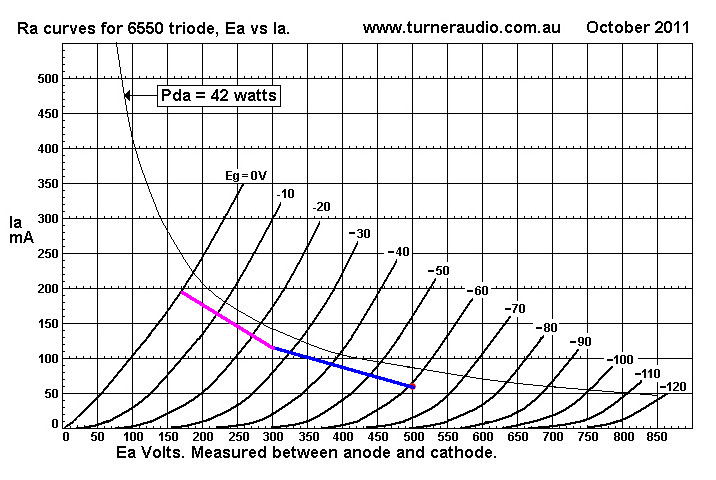 The characteristic curves for a 6550/KT88, both Ultralinear and Triode mode, are shown below. The operating point will be at Va=500V and Ia = 60ma, for an idle dissipation of 30W, well under the maximum of 42W. The operating points are indicated by the red dots. 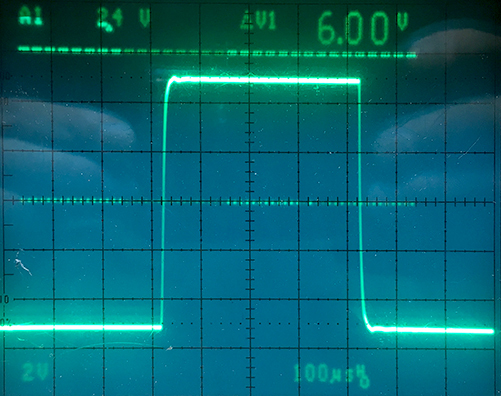 Class A operation is shown by the blue line and corresponds to an Ra-a = 3.3K (1/2 of the transformer Ra-a of 6.3K.) Class A operation ends when Ia hits 120ma (2 X 60ma), because this means that Ia goes to zero when the sine wave goes maximally negative. 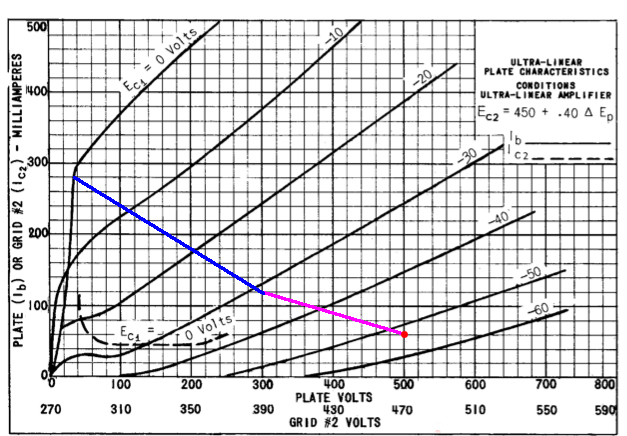 Class AB operation is indicated by the purple line and ends when the grid voltage hits 0V (grid current begins to flow). 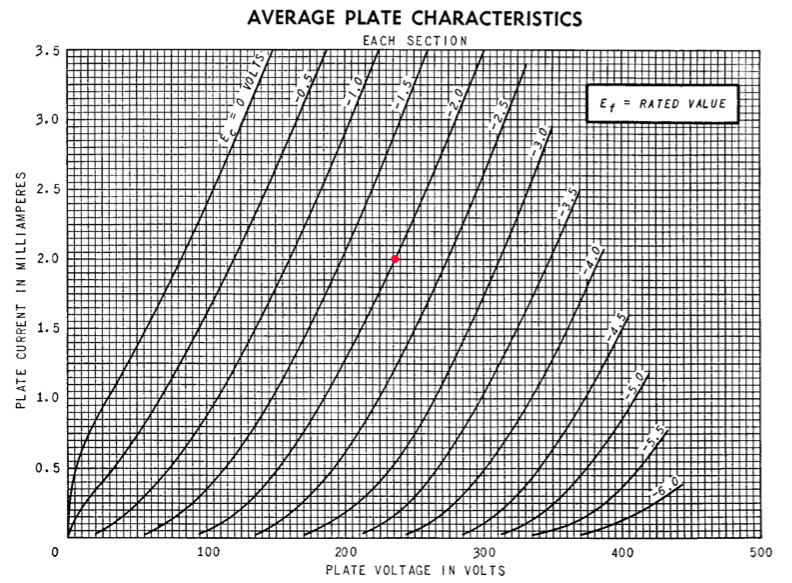 The bias voltage, from the curves, is around -52V for ultralinear and -62V for triode. So the amp can theoretically produce 65W in ultralinear, 33W in triode. 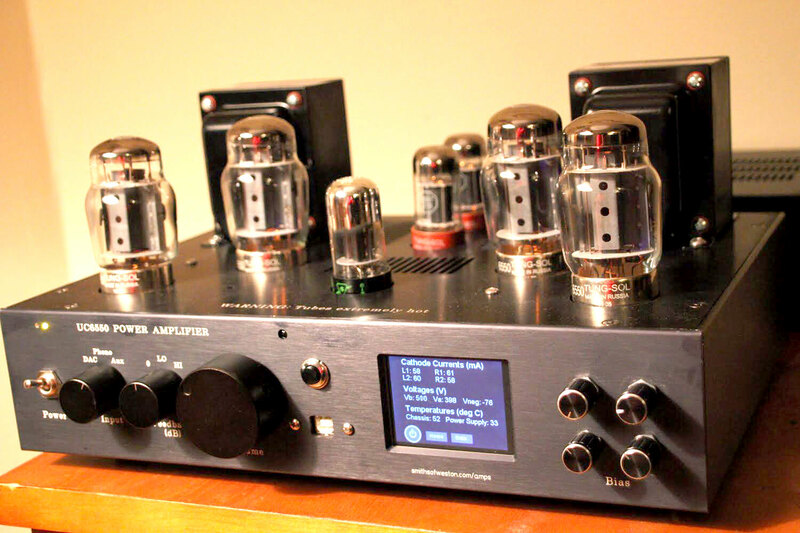 In actual measurements, there is no way this amp will make that much power before ridiculous distortion. FB (in dB) = 20log(Vi/Vgk). Triode:A = 43/.35 = 123. Triode:A = 43/.2 = 215. So, the input stages will need to be capable of providing a gain of at least 215 to push the power tubes to full power with maximum feedback in place. The first stage is a grounded cathode amplifier, but with a constant current source (CCS) replacing Ra. 6SL7's will be used. The constant current source (CCS)is adapted (well, stolen) from Morgan Jones' "Valve Amplifiers." The voltage across R12 is determined by V across the LED (around 1.8V) + Vbe of the PNP transistor (around -.6). The LED compensates for any temperature variations of Vbe. 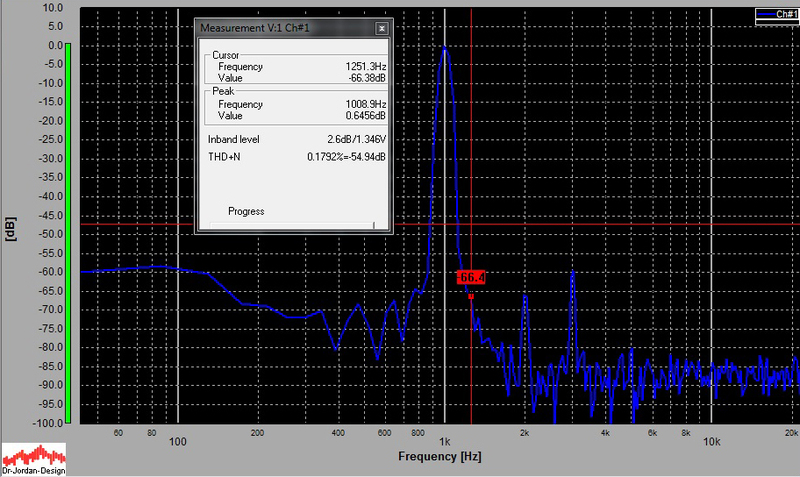 The operating point is set at 2ma, R12 = 1.2 / 2ma = 600ohms, but the actual value is 620 determined empirically. This CCS blocks any AC current (since the current NEVER changes from 2 ma). This means that for AC, the anode resistor is infinity (actually about 30-40 Mohm). where Ra = anode resistor, RL = load resistor. As Ra approaches infinity (possible with the CCS), A approaches mu. The mu of a 6SL7 is about 70, so the gain of this stage should be around 70. In reality it measures out around 60. The cathode resistor is divided into a 953ohm resistor and a 47 ohm resistor. The top of the 47ohm resistor is the injection point for feedback. A long-tailed splitter generates two waveforms, each 180o out of phase with the other. These are fed into the push-pull power stage. The very linear 6SN7's will be used for this stage. Their characteristic curves are shown below. They are most linear with Ia > 6ma, according to what I read, and my own testing. .7 + 6.2 - V(R7) - .7 = 0. So V across R7 is ALWAYS 6.2V. We can set the current by adjusting R7. R7 is set to 390 ohms, which gives I = 6.2/390 = 16ma, which means 8ma flows through each tube. Now, Va = 400 - 8ma*22K = 224V. This operating point is shown below as a red dot. 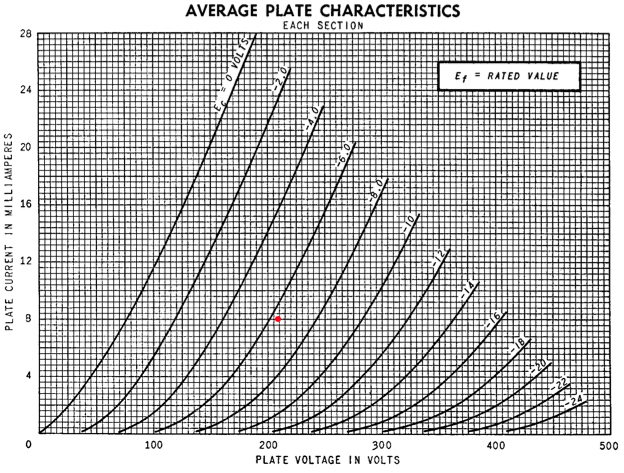 R1 and R2 are actually 23.5K (2 47K's in parallel), so they each drop 23.5*8=188V, which means voltage at each anode is 212V. Gain is about 7.5 or so making a total gain of the input stage greater than 400 (60 * 7.5), which is close to twice what is necessary. 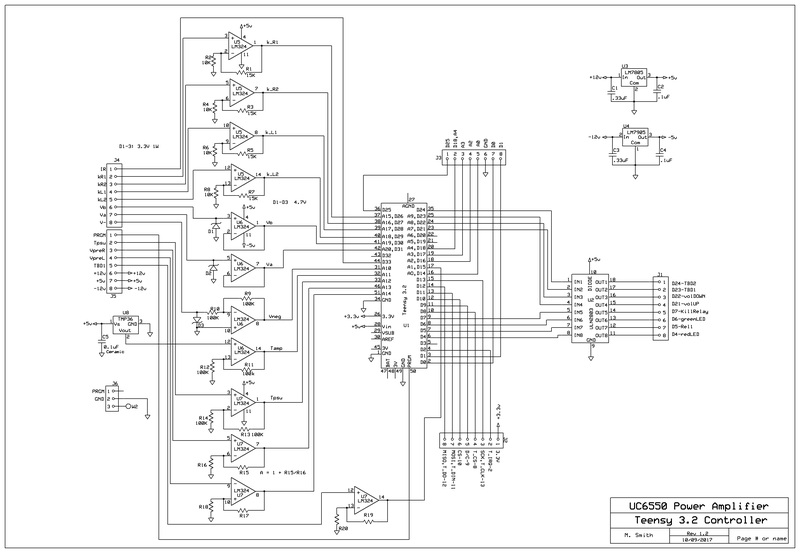 The PCB schematic for the drivers for both channels is shown below. Q5 and Q7 must be heatsinked. The feedback resistors with their capacitors are contained on a separate board and run through rotary switches to vary the amount of feedback.. The schema for feedback is shown below. A 3-position switch on the front panel controls the amount of global feedback (0,LO,HI) and a 2- position switch on the back switches between ultralinear and Triode mode. This is on the back because it can be dangerous for the health of the amp if this switch is turned with the amp on. Big warning label on the back. "LO" is 6dB for ultralinear mode and 12dB for triode. "HI" = 12dB for ultralinear mode and 17dB for triode. The values of the resistors were determined mathematically. I wrote an excel spreadsheet which does the calculations. The values of the capacitors were determined empirically as described below in the section on feedback compensation. The power tubes will require about -53Vdc applied to each grid in ultralinear mode and around -60Vdc in triode mode. 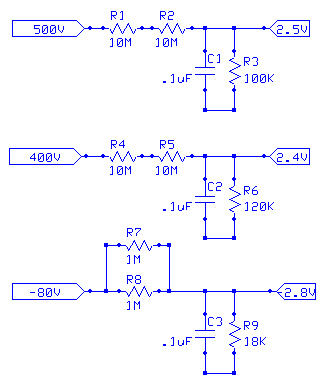 The bias circuit for each tube is shown here. These will be point-to-point wired so no PCB is necessary. The bias for each power tube will be controllable from the front panel of the chassis by 4 100K potentiometers, shown as U1 in the schematic. 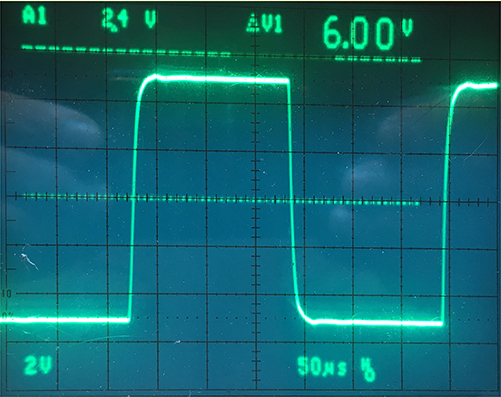 The bias controls the anode current as well as the screen current. Cathode current, an OK proxy for anode current is measured across the 1-ohm cathode resistor. After messing around for a long time with an Arduino Uno microcontroller and actually designing circuit boards to attach to the arduino board, I concluded that it took up too much space. Note that the final board(s) has 3 levels to handle the multiplexer and shift register that are required because the Uno doesn't have enough I/O ports. The arduino Uno board is the green one on bottom. The two above were designed by me. So after a lot of work and a little money, I abandoned the Arduino Uno and looked for a more compact microcontroller with a lot more I/O pins. 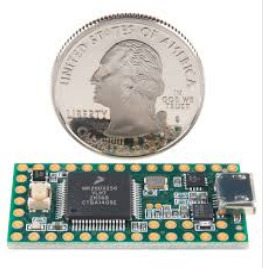 This little sucker is a teensy32 microcontroller. It has basically the full power of the Arduino Uno, but it has 21 digital I/O pins, 19 digital/analog pins, and 2 pins that are analog only. That is a total of 42 I/O pins! 22 of the pins are PWM. That is insane. Absolutely no need for a multiplexer or shift register or any of the other cumbersome logic required by the Uno. I designed the circuit below to be the I/O board for the teensie shown above. There are 12 op-amps contained in 3 LM324 quad packages; these handle the inputs from various parts of the amp; To the right are 9 Darlington buffers contained in a single IC - these output to the power supply relays, the volume control relay, and LED's. The teensy3.2 board is in the center. Some of the inputs from the amp are 400-500V. I really don't want these voltages coming on to my delicate little teensy3.2 board, so the little circuits to the left reduce these voltages to appropriate levels for inputting into the op amps that will input into the teensy. Corrections will be made in the Arduino program. The power supply consists of the transformers and rectification sitting in its own chassis plus a voltage regulator and smoothing circuitry sitting in the amplifier chassis. The power supply chassis is connected to the amplifer chassis by a 12-conductor power cable. 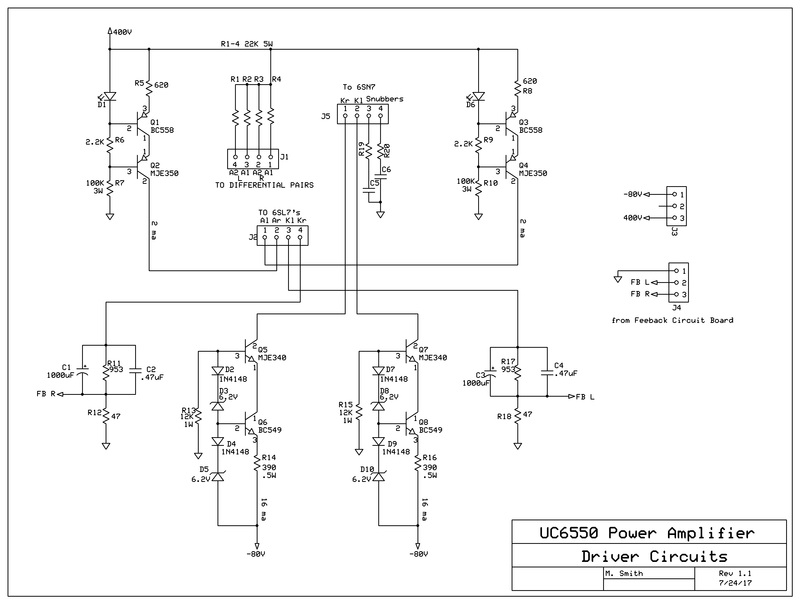 Below is the schematic for the circuitry in the power supply chassis. After rectification, 560V and -100V are sent to the amplifier chassis to be conditioned further. A 12V supply is also sent, as well as the 6.3V AC for the tube heaters. A note about the relays. These are controlled by the Teensy 3.2 microcontroller in the amplifier chassis, and are used to provide a slow start for the big transformer. When the transformer is powered on and rectified, huge currents flow into the capacitors until they are charged. This can actually cause the house lights to dim. To mitigate this somewhat, Relay 1 is energized first, which means the current going into the transformer is limited by the 25W 12 ohm resistor. After a period of milliseconds (I haven't decided exactly how much yet), relay 1 shuts off and relay 2 is energized which allow full current to flow into the transformer. Red and Green LED's show the progress of this startup. Below are the square responses of the UC6550 with feedback in both triode and ultralinear modes. There is significant ringing in all modes except ultralinear with 6dB. This means that the amplifier could be unstable at high frequencies without compensation networks put in. All compensation networks are designed to attenuate gain at high frequencies. Below is the entire amp with the compensation networks circled. The method I used was taken from a great article by Tim E. Smith on angelfire.com entitled "Empirical implementation of global negative feedback." The first compensation network is at the output transformer. The technique is taken from Radiotron Designer's Handbook, 4th edition from the 50's. It recommended a resistor value equal to the Ra-a of the transformer. So 6.8K was close enough. C = 1/(100000*Ra-a) = 1.5nF. 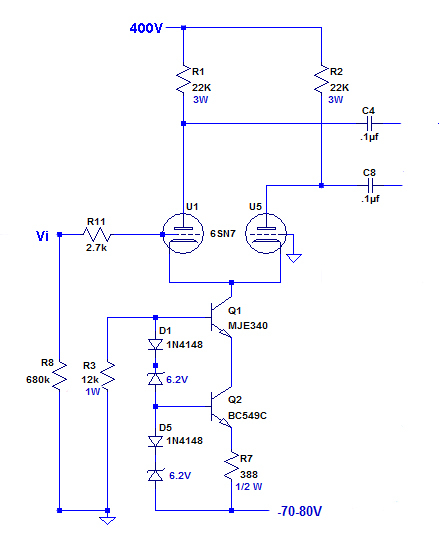 The next snubber is at the input to the differential amplifier. The values for R and C are derived entirely empirically. I adjusted a 100K potentiometer and a variable capacitor to eliminate the ringing with the least amount of high frequency attenuation. It turns out that in the ultralinear setting, no input snubber was really necessary. The optimum values that seemed to work with the triode setting at both low and high feedback settings were R=10K and C=220pF. Finally, a capacitor is placed across the feedback resistor itself. 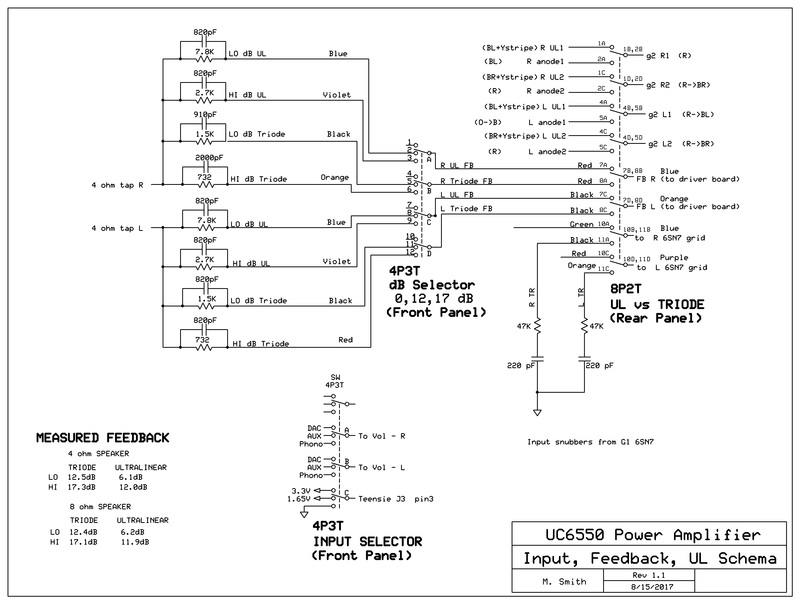 Remember that the feedback resistor shown is actually 4 resistors, selectable by the mode switches as shown above on the "Input, Feedback, UL Schema" diagram. The capacitor for each resistor is adjusted until the desired effect is achieved. The idea here is to reduce the reactance of the feedback network at high frequencies, thereby increasing the feedback and reducing gain. The results of the adjustments are shown below. These are for triode mode with 17dB of feedback. I will only show the right channel, because the left channel is essentially identical. 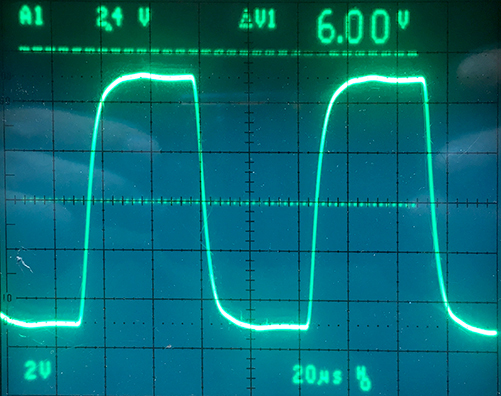 A very nice square wave is seen with the 1kHz square wave input. No ringing or raggedness. At 3kHz it's not quite as crisp, indicating that there is some high-frequency rolloff. At 10kHz, there is some definite rounding on the leading edge. Only a very small percentage of people can hear 10kHz anyway, and definitely nobody of my advanced age. I happen to hate the harsh sound of some amplifiers, and I think that the compensation networks as designed give a very slight treble reduction which I find desirable. So far, nobody has said that there seems to be something missing at the high frequencies in my amps. TRIODE - At this setting, 25-30W of power are possible before clipping. At the 17dB setting, 30W are possible with THD of around .4%, a surprising amount of that being 2nd order harmonic, which is not unpleasant. The dominant harmonic is 3rd harmonic, which is expected with a push-pull arrangement, which eliminates most even order harmonics. ULTRALINEAR - as expected, more power is available before clipping. With all feedback, 45-50W are achievable. Listening tests are necessary to determine the setting one likes best. 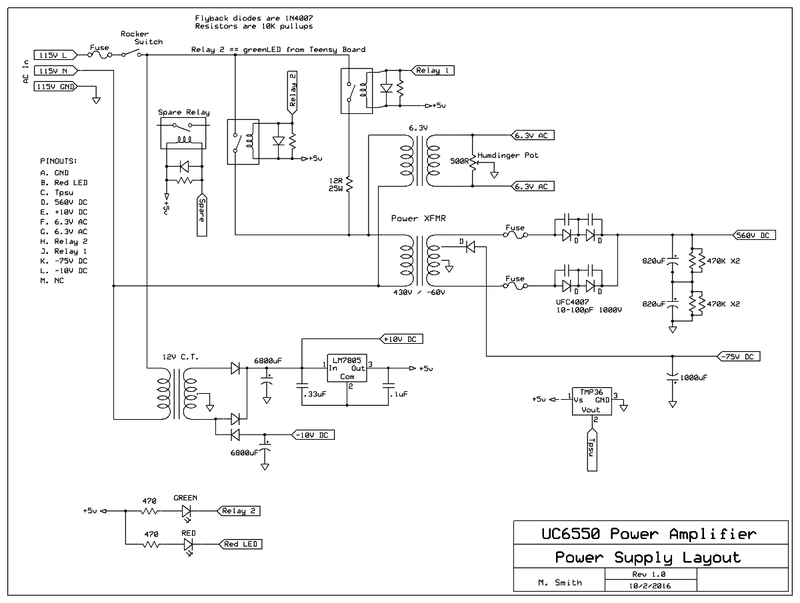 Maybe if I get a concensus, I'll design an amp that is not Unnecessarily Complex, like this one.